Last October, Clayton Kershaw was out-dueled by Ty Blach, but Kershaw got the upper hand in the rematch. He pitched the entire game in discomfort after he was hit by a comebacker on the second pitch of the game. 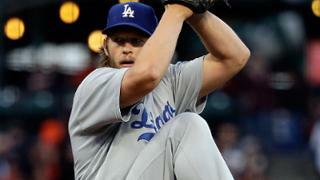 Despite his pain, Kershaw pitched seven innings of one-run ball, with seven strikeouts. If I had not already told you, you would likely never guess that Kershaw was pitching in pain. He was hit in the calf on his right leg. If he had been hit on the left, chances are that he would have been forced to leave because he needs his left leg to push off the mound. The Giants took the lead in the third inning through a series of unlucky events for Kershaw. Pitcher, Ty Blach hit a fly ball to center field that usually is playable, but the outfield was playing in, causing the ball to go over Kiké Hernández and Cody Bellinger. Next, Hunter Pence hit a groundball off the mound, the second comebacker hit by Pence in the game. Chris Taylor did not charge the ball and Pence legged out an infield single. Kershaw then struck out the next two batters and Buster Posey came to the plate. He hit a seeing-eye single right past a diving Corey Seager. Blach scored and the Giants took a 1-0 lead over the Dodgers. Adrián González was the next batter and was trying to give Kershaw the lead. He hit the ball on the ground to Posey, who threw the ball to Brandon Crawford to start what should have been a double play. Instead of throwing to first base for the second out, Crawford threw home in an attempt to keep Turner from scoring. The throw was not perfect and Nick Hundley was unable to catch the ball and Turner scored. Cody Bellinger made his Major League debut for the team he grew up rooting for, the Los Angeles Dodgers. The Dodgers promoted him because they need a power hitter in the lineup. He went 1-3 with a walk. His first hit was an infield single to third base. Before he collected his first hit, the Giants intentionally walked him. Justin Turner scored the go-ahead run in the fourth inning with some very aggressive baserunning. It was only one day since he was picked off at second base by Buster Posey, but he was still aggressive on the bases. Turner was on third and Puig was on first with no outs and Adrián González at the plate. González hit a groundball to Buster Posey at first base, and Turner had to hold up. When Posey threw the ball to second, Turner was off, running hard, and he scored, just beating the throw from Brandon Crawford. Clayton Kershaw was pitching through discomfort for 88 of his 90 pitches on Tuesday. He was struck in the leg by a comebacker, but stayed in the game, giving the Dodgers’ bullpen a much-needed break. He allowed only one run on six hits and struck out seven. Alex Wood will start in the place of Rich Hill for the Dodgers, he will face-off against Johnny Cueto. Cody Bellinger is scheduled to make his second Major League start, this time against a righty. Justin Turner is a career 7-21 against Cueto with a home run and two RBI. The game will start at 7:15 pm PT. It will be broadcasted on SportsNet LA.